A few weeks ago former Formula One driver Nelson Piquet Jr., whose claims that he was told to crash intentionally led to the suspension of the Renault team, announced that he would be moving to America to pursue a stock car racing career. However, the timing of the move seemed curious as most of the top-quality rides in NASCAR were already locked up. 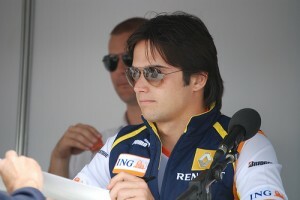 However, Piquet Jr. is by-passing NASCAR for his debut in stock car racing and going to the smaller ARCA series. He tol The Press Association that he has signed a deal to drive for Eddie Sharp Racing starting with the Lucas Oil Slick Mist 200 at Daytona on February 6. Piquet Jr.’s debut is sure to be overshadowed by another driver making their stock car debut during the race – Danica Patrick. “I’m very excited,” said Brazilian Piquet. “I can’t wait to reach 200mph side-by-side and rubbing paint.